Elmer E. Easley was born at Dix, Illinois, September 19, 1871, where he grew to manhood and entering into business, first, at the age of 24, as an employe in a furniture and undertaking business, which he bought out five years later and conducted same until 1902, and during these eight years he was postmaster at Dix from 1906 to 1902. Having sold the business he went to Wayne City, where he bought a furniture and undertaking business which he conducted until 1911 when he sold out and moved to Virden, Illinois, where he lived four months before coming to Clay City in July, 1911. Mr. Easley dropped into Clay City incidentally early in July, 1911. He knew not a living soul in the town but after looking it over he was impressed with the appearance and walked directly to the C. R. Mills & Sons furniture and undertaking establishment, asked to buy their business, they priced it and it was sold. Mr. Easley took charge on the Fourth of July, moving his family here in September following. From the day he first arrived here and to this time he has been a constant booster for the town. 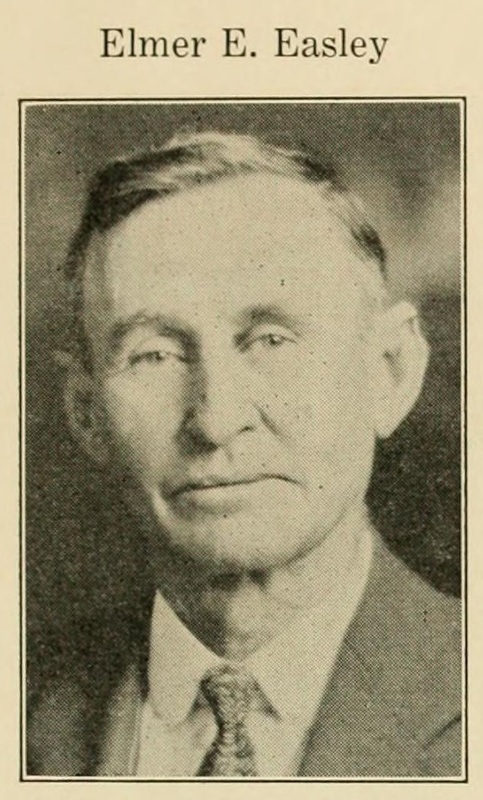 In 1913 he was elected president of the village board and served two terms after which he served as a member of the board and again elected president which position he is still holding. He was elected in 1926, coroner of Clay county to fill vacancy. In 1928 he was re-elected coroner for a full term of four years. He was chosen on the school board about the year 1916 or '17 and has constantly and still serving the district as president of the board. Last year he completed the erection of one of the finest store rooms in Clay City to which he moved his stock of furniture and undertaking supplies from the I. O. O. F. building which he had occupied and now a more up to date store of this kind may be found in much larger cities only. His son, Gale, a licensed embalmer, is associated with him in the store and undertaking.